America is a living structure of human lives, of all the American lives that ever were and ever will be. Jake Holman knew he was a strange bird and he was used to going aboard new ships. For us who wear the uniform, every day is Flag Day. We pay our honor in act and feeling and we have little need of words. In our flag the barriers of time and space vanish. 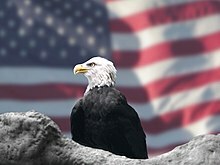 All America that ever was and ever will be lives every moment in our flag. Wherever in the world two or three of us stand together under our flag, all America is there. When war comes, it is we who will take the first shock and buy time with our lives. It is we who keep the faith. "Hello, ship," Jake Holman said under his breath. The ship was asleep and did not hear him. Jake Holman knew he was a strange bird and he was used to going aboard new ships. By the time they realized they were in a struggle Jake Holman would already have made for himself the place he wanted on their ship and they could never dislodge him. Or wish to. "Tomorrow we begin our summer cruising to show the flag on Tungting lake and the Hunan rivers," he said. 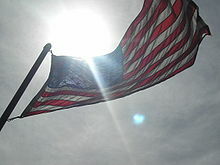 "At home in America, when today reaches them, it will be Flag Day. They will gather to do honor and hear speeches. For us who wear the uniform, every day is Flag Day. We pay our honor in act and feeling and we have little need of words. But on this one day it will not hurt us to grasp briefly in words the meaning of our flag. That is what I want to talk about this morning. "Our flag is the symbol of America. I want you to grasp what America really is," Lt. Collins said, nodding for emphasis. "It is more than marks on a map. It is more than buildings and land. America is a living structure of human lives, of all the American lives that ever were and ever will be. We in San Pablo are collectively only a tiny, momentary bit of that structure. How can we, standing here, grasp the whole of America?" He made a grasping motion. "Think now of a great cable," he said, and made a circle with his arms. "The cable has no natural limiting length. It can be spun out forever. We can unlay it into ropes, and the ropes, into strands, and the strands into yarns, and none of them have any natural ending. But now let us pull a yarn apart into single fibers —" he made plucking motions with his fingers " — and each man of us can find himself. Each fiber is a tiny, flat, yellowish thing, a foot or a yard long by nature. One American life from birth to death is like a single fiber. Each one is spun into the yarn of a family and the strand of a home town and the rope of a home state. The states are spun into the great, unending, unbreakable cable that is America." "No man, not even President Coolidge, can experience the whole of America directly," Lt. Collins resumed. "We can only feel it when the strain comes on, the terrible strain of hauling our history into a stormy future. Then the cable springs taut and vibrant. It thins and groans as the water squeezes out and all the fibers press each to each in iron hardness. Even then, we know only the fibers that press against us. But there is another way to know America." He paused for a deep breath. The ranks were very quiet. "Understand that our flag is not the cloth but the pattern of form and color manifested in the cloth," Lt. Collins was saying. "It could have been any pattern once, but our fathers chose that one. History has made it sacred. The honor paid it in uncounted acts of individual reverence has made it live. Every morning in American schoolrooms children present their hearts to our flag. Every morning and evening we render it our military salutes. And so the pattern lives and it can manifest itself in any number of bits of perishable cloth, but the pattern is indestructible." Civilians are only morally bound to salute our flag. We are legally bound. All Americans are morally bound to die for our flag, if called upon. Only we are legally bound. Only we live our lives in a day to day readiness for that sacrifice. We have sworn our oaths and cut our ties. We have given up wealth and home life, except as San Pablo is our home. It marks us. It sets us apart. We are uncomfortable reminders, in time of peace. Those of you who served in the last war know what I mean. It is said there will be no more war. We must pretend to believe that. But when war comes, it is we who will take the first shock and buy time with our lives. It is we who keep the faith. We are not honored for it. We are called mercenaries on the outposts of empire. … We serve the flag. The trade we follow is the give and take of death. It is for that purpose the American people maintain us. Any one of us who believes he has a job like any other, for which he draws a money wage, is a thief of the food he eats and a trespasser in the bunk in which he lies down to sleep! He had a light in his gaunt face and his voice and manner were strangely solemn. The were all a bit afraid of him. … "We're mixing our lives together, Maily, and we'll never be able to unmix them again, and we'll never want to." His voice was strong but tender, and he was smiling down at here. "I take you for what you are, and all that you are, and mix you with all of me, and I don't hold back nothing. Nothing! When you're cold, and hungry, and afraid, so am I. When you're happy, so am I. I'm going to stay with you all that I can, take the very best care of you that I can, and love you every minute until I die." He took a deep, slow breath. "Now you say it"
"I will always love you and honor you and serve you, Frenchy, and stay as near to you as I can, and do everything for you, and live for you, and I won't have any life except our life together…" Tears welled out of her eyes but she smiled steadily up without blinking. "I will just love you, Frenchy, all of me there is just loving you forever." This page was last edited on 14 January 2018, at 17:37.